Boiler MACT: Another Air Regulation? Although regulations are important, they can sometimes cause confusion or frustration. Have you been hearing about the Boiler MACT (Maximum Achievable Control Technology) or the Boiler NESHAP (National Emissions Standards for Hazardous Air Pollutants) at conferences or from other sources? The information below will help you determine if the Boiler MACT applies to your wastewater treatment plant, drinking water plant, and other municipal operations. Does this requirement apply to your equipment? Still not sure if you apply? Still a bit concerned if the Area Source Boiler NESHAP applies to you? Look at the USEPA’s Fast Facts sheet or the Summary of Regulations for more information. The Summary provides a table with the type of boiler, fuel type and a brief description of the requirements. If the requirement does apply to you, an Initial Notification to the USEPA and IDEM is required by January 20, 2014. 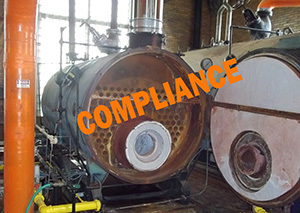 Additional information can be found at the USEPA’s Boiler Compliance at Area Sources webpage. Information referenced above is provided by the USEPA (http://www.epa.gov/boilercompliance/) and IDEM (http://www.in.gov/idem/ctap/2349.htm).